I'm beyond excited to share today's gorgeous wedding with y'all! What's so special about this one? It has a bright, bold, beautiful color palette that is unlike most of the ones we see at The Barn! (We see lots of pink and pastels, and while we adore those, it sure is a special treat when we get to play around with bright colors!) The theme and colors of this wedding just scream summer, and the details were beyond pretty. It was the perfect way to kick off our busy summer wedding season! This wedding was so beautifully captured by BnBauman Photography. These photos are dreamy, and I can't wait for you to see them! Alyssa and Matt were married at The Barn at Twin Oaks Ranch on May 30, 2015. They chose royal blue with pops of red and yellow as their color scheme, and for their theme, they wanted something fun and not-too-serious. I'm going to call the style of this wedding garden-rustic-chic. :) Whatever you want to call it, it was total eye candy! "We are a fun loving and easy going couple!" Alyssa said. "We wanted our wedding to reflect our personalities and our families. The last thing I wanted was something that felt too formal, and I think our colors kind of helped set the tone for the day!" Before we dive into all the other details, let's talk about what these pretty people wore! Alyssa's bridal gown, from Low's Bridal, is truly one of the prettiest dresses ever. I love that this dress is modest and has such pretty details. The silhouette is perfection. And would you look at that insane detailing on the back?! LOVE. Alyssa, you are such a stunning bride! The bridesmaids wore royal blue dresses that were more on the casual side, which was such a great look for this fun, bright colored summer wedding! The junior bridesmaids wore yellow dresses and the prettiest flower crowns. The groom and his guys wore gray suits with mismatched blue ties. I love this look! And I love that these guys chose patterned ties, too. I'm always crazy about patterns in wedding attire or decor, and I don't think they're used nearly enough! This groom's tie is seriously awesome. This bridal party looks so good. Can't get enough of this fun color palette! Alyssa's yellow bouquet was absolutely stunning and unique. She also wore yellow flowers in her hair! All these yellow flowers just make me smile. :) The bridesmaids carried blue and yellow bouquets with pops of red. These bouquets had a natural, just-picked look that was so pretty with this fun theme! "I was worried about the colors looking like an elementary school classroom exploded since I chose primary colors," Alyssa said. "But everything from the bouquets to the centerpieces were a perfect combination of the colors. It was fun, bright, and happy without being too much." Before their ceremony, Alyssa and Matt chose to have a first look at their ceremony site. This first look is a great example of why we love first looks! These two had a few private, quiet, romantic moments to themselves before all the craziness that happens on a wedding day. Plus, they got a bunch of gorgeous photos that they'll treasure forever! Best wedding accessory everrrrr. Alyssa said her monogrammed Converses were one of her favorite details, and I'd have to say they're one of mine, too! Alyssa and Matt's ceremony details were bright and colorful and fun and happy, just like all the other pretty details of their day! Their altar was unique... It wasn't draped with any fabric, but it had blue, yellow, red and white flowers across the top. Simply beautiful! Their aisle was lined with logs topped with flower arrangements in jars, which matched the bridesmaids' bouquets and the altar arrangements. Their guestbook table also had a couple of matching arrangements, a stack of vintage books and one of their engagement photos. Their guestbook itself was also unique! "Our wedding guests signed a bench (made by my brother-in-law and painted by my mom and I) as the guestbook," Alyssa said. "It's in the entryway to our home, and I love that I am welcomed everyday by a sweet little reminder of all of the love and support Matt and I are surrounded by! So glad we chose to do something that's not by the book (haha pun intended... I crack myself up)." You crack us up too, Alyssa! ;) And I adore your fun guestbook alternative! Alyssa and Matt's ceremony was romantic and incredibly sweet. "I will always remember the moment when I was standing at the end of the (what felt like it was a mile long) aisle and first made eye contact with Matt," Alyssa said. "With my dad by side and all of our friends and family standing for me, time stood still. I know, I know, how cheesy. But it’s so true! Matt and I were together for 6 years, and engaged for 2 of those, before our wedding day. I think I was so used to thinking that our wedding was forever away, that it managed to sneak up on me! But in that specific moment, making eye contact with my best friend and soon husband, I think it finally sunk it. I will always cherish that sweet memory." How cute are these tiny wedding attendants?! Another glimpse at that gorgeous, colorful aisle! Seriously obsessed with this dress! One thing we do for each of our couples on their big day: we let them view The Barn before any of their guests are allowed inside. It allows them to see everything before things get crazy, and it also gives them a few sweet moments to soak in the fact that they're finally husband and wife! This photo of Alyssa and Matt in that moment is the sweetest! Alyssa and Matt's reception details were also full of color. They were fun and had a bit of a rustic-chic vibe, with plenty of garden-themed details (like floral arrangements with a just-picked feel and vintage watering cans) worked in, too. Their tables also included royal blue runners, clear jars, white jars and vases, stacks of vintage books, vintage wooden boxes, candles and simply pretty place settings. These two also had the cutest, most deliciously colorful dessert table ever. For favors, Alyssa and Matt gave Cokes in glass bottles, which were at each guest's place setting. They were the perfect pop of red for this blue, yellow and red wedding! Favors that double as decor are always a good thing. When the night came to a close, Alyssa and Matt made their grand exit through a tunnel of sparklers and off to their fun, totally awesome honeymoon! "We went to Disney World!" Alyssa said. "We probably walked 40 miles over the course of our stay, but it was so much fun! Matt even let me drag him on to The Tower of Terror multiple times! That’s impressive!" As I always ask our brides, I asked Alyssa to let us know how she thought we did throughout her wedding planning process and on her wedding day. Here's what this sweet lady had to say about us! "My parents live in Maryland so they were not able to be ‘hands on’. 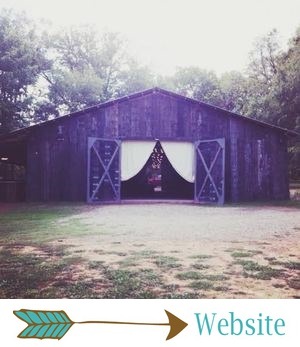 The Barn staff paid close attention to our ideas during our planning meetings and completely captured our vision for our wedding day. It was such a blessing that not only did I not have to sweat the details, but neither did my parents! They were able to travel the 1000+ miles and enjoy the celebration! I can’t say enough!"